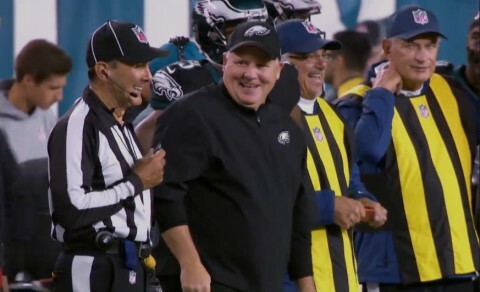 For the first time ever in his head coaching career, Chip Kelly’s season ended when the regular season did. It’s got to be killing him, as proud as he no doubt is that his Ducks destroyed Florida State and are heading into the National Championship Game favored by a touchdown. As I’ve said before, he’s Moses, unable to enter the Promised Land and watching his people go on without him. Bittersweet. It’s all fun and games until someone gets promoted. 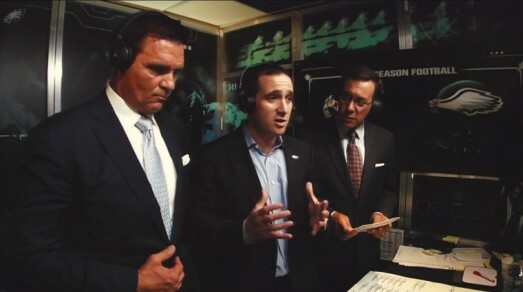 My last column detailed the Byzantine power struggles that week in which GM Howie Roseman fired Kelly’s ally, Player Personnel Director Tom Gamble — followed two days later by Roseman getting kicked upstairs to a VP job with no power over roster selection. He’s still in charge of contracts, free agent re-signings, and the salary cap, though, and that’s a big concern going forward. It’s a bad idea to have someone in such a key role with lots of reason to resent, and possibly undercut, the coach. Another week has failed to clarify everything that went down, but three of the Eagles’ beat writers presented compelling (if somewhat speculative) visions that are worth reading if you like this kind of manly soap opera. Geoff Mosher of CSN Philly painted a dark and compelling portrait that rings true but leaves me worried about future conflict between Kelly and Roseman, whom former staff paint as shrewd but paranoid. The idea that Kelly and Roseman are out of each other’s way now is absurd. They still have to work together when it comes to player retention, free-agent signings and other areas where money and personnel blend. What happens when Kelly wants to keep a player Roseman believes is overvalued? At least Mosher has good — heck, downright ecstatic — things to say about Ed Maryonwitz (pronounced “manowitz”), the Eagles’ very young assistant director of player personnel. Maryonwitz was the first candidate named as Roseman’s potential replacement. At 30, though, he seems too young to earn the respect of other GMs around the NFL. On a lighter but no less shrewd note, the Inquirer’s Bob Ford had great fun ridiculing the idea that Roseman was promoted. As his parting gift from the world of real power in the organization, Roseman got a shiny new title, a contract extension, and as much tinsel as the team could publicly layer onto his demotion. And more! Not that sorting out a pesky hip-pad issue in the equipment room wouldn’t be enough to satisfy any eager executive on a job well done, but Roseman will get to do even more. “He could tell you that a guy would go in the second round — he couldn’t tell you if that player would be good,” a former team employee said. Knowing the draft value of a player you want is incredibly helpful. But will Roseman be willing to help Kelly look good, after the coach pushed him out of his dream job? We’ll know a lot more by May 2 when the last pick is in. What were we talking about? I got distracted. Speaking of the draft, I had — like most Eagles writers — written off the prospect of Philadelphia picking up Marcus Mariota as a pipe dream, given that he’s projected as the first or second choice in the draft, and the Eagles choose at #20. There’s just no way to move up that far. I’m not completely from the school of thought that Marcus is going to go in those top two, three, four or five picks. I think there’s a chance he may slide a little bit as this goes. If he gets into that eight, nine, 10 (spot), or even early teens, there may be an opportunity for Philly to go get him if they want him that bad. It sounds too good to be true, but just look at last year’s draft. Teddy Bridgewater and Johnny Manziel were both projected #1 pick at one point, before falling way down the draft board. The Eagles passed on Manziel at #22, trading away the pick, and Bridgewater barely made the first round at 32, even though many teams now wish they had picked him much higher. The bottom line is that these valuations jump all over the place. 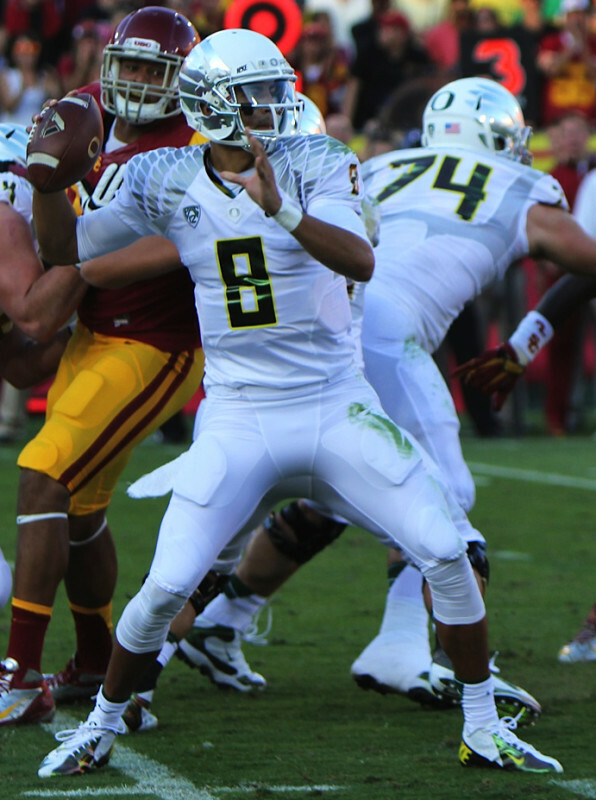 A national championship won’t diminish Mariota’s luster, but a shaky combine or even just NFL conventional wisdom about “pro style quarterbacks” who need to play in the pocket and hit tight windows, might do the trick. 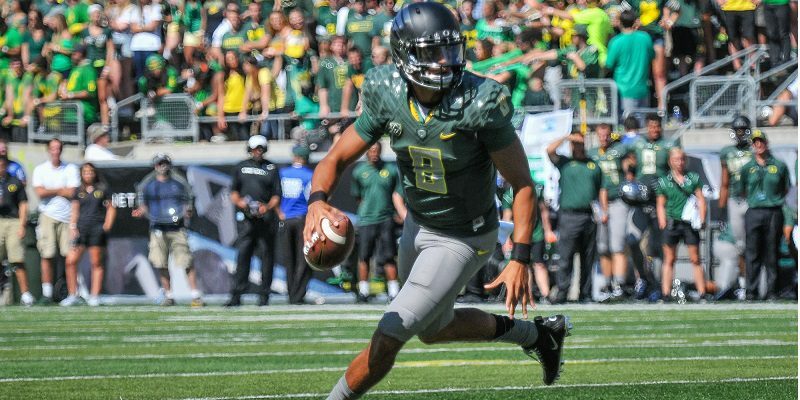 I hate to get my hopes up, but Mariota has reason to like the idea. Philadelphia has a good offensive line to protect him and a system he thrives in. All Marcus has to do is run a slow 40 at the Combine, or get caught with hookers in an opium den a couple of times before May, and all of our dreams may yet come true. And Chip might enter the Promised Land after all.